Q: Chicago has a rich cultural legacy - from our institutions, to our diverse community of artists and patrons. Can you give us an overview of the Art Institute’s early years and how the 1893 World’s Fair and the 1913 Armory show lead to the museum’s stellar collection of modern art? D'Alessandro: One thing that I think is so great about the Art Institute is that almost at the moment of its founding was this great desire to reflect the city and the city itself being one that was very, very modern. The art that was collected here was always connected to the spirit of what was new, what was fresh. The Columbian Exposition in 1893 was about celebrating Chicago after the fire. The Art Institute was founded a little before, but in lots of ways the museum started with the fair, a temporary fair building became the permanent collection building for the Art Institute. Finally, the museum was able to have a place, right in the heart of the city to build the collection that we have. While the building is one legacy from the fair, the other is the connection of Chicago with the new in terms of art itself. There was a contemporary art exhibition of French painting at the fair, which for us now means Impressionism. Collectors saw this art and it instilled a taste for the new at the time. When you think of the Art Institute’s collection, one of the great legacy collections is our Impressionist and Post-Impressionist collection. The roots of the collection happened at the fair as Mrs. Potter Palmer and the Ryersons and the Colburns all began to collect French Impressionism. The collection on the third floor of the Renzo Piano Modern Wing doesn’t have Impressionism in it, but it reflects the legacy of that World’s Fair. Arthur Jerome Eddy, a brilliant attorney, became a great instigator of modern art in the city. He saw the work at the fair and became interested in collecting. For him, that meant Picasso and Kandinsky. He formed relationships with dealers in Paris and now, our German Expressionist collection is because of Arthur Jerome Eddy. The World’s Fair announced Chicago back on the scene as this modern city and also had this great connection with the collection that is around us today. The legacy is in every gallery that you walk through. Q: The Art Institute was the first American museum to show Picasso. Does Chicago’s tradition of being on the cutting edge live on as part of our cultural identity? D'Alessandro: The first Picasso that was acquired by an American museum was The Old Guitarist in 1926. It was a gift to the Art Institute from the Birch-Bartletts. Mr. Bartlett was an artist himself and Mrs. Bartlett was a poet who was involved in Poetry magazine. They collected together and were married for a short time before she passed away. They owned La Grande Jatte and a really important group of works that were given to the museum in 1926 in honor of Mrs. Bartlett. These works were put on permanent display. At our museum in 1926, three years before MOMA was founded, 13 years before the Guggenheim was founded, there was a presence here of Picasso, of Matisse, Modigliani and many Post-Impressionists, just to name a few artists. It is an important thing to think about, the way Chicago put itself on the map so early. Q: How would you characterize how that tradition lives on today? D'Alessandro: One thing that characterizes the early moment for me is a sense of boldness. I think that, as far as the modern collection goes, we continue to be bold. For example, in 1953/54 Bathers By a River by Matisse had already been in a retrospective and had gotten lots of focus. Museums looked at it, but decided it wasn’t for them. When it became available, the Art Institute galvanized itself to acquire this picture. It wasn’t something that was easy to acquire at the time. I think that Daniel Catton Rich had quite a battle to convince the board of trustees and others that we needed to acquire it. Now, it’s one of the lynchpins of the collection, something we can’t imagine not having. Even a few years ago, we learned a lot from that picture that we didn’t know before. That’s one way that I think that we’re bold. Three years ago, we acquired a wonderful Malevich from 1915. The piece was in his first exhibition, when he debuted his really radical way of painting. It was something that many museums wished they could’ve acquired, and it was something on my dream list. We worked very hard to make that a possibility for us. I think one way that we continue to be bold is by recognizing the great collection we have here and being fearless in our way, to continue to make it even better. Stephanie D'Alessandro discusses Chicago's legacy of boldness in the arts. "One thing that I think is so great about the Art Institute is that almost at the moment of its founding was this great desire to reflect the city and the city itself being one that was very, very modern. The art that was collected here was always connected to the spirit of what was new, what was fresh." Q: Can you talk a bit about the Art Institute’s importance to Chicagoans today? D'Alessandro: I think what is interesting in thinking about that idea is how each citizen is not just counted once, but as their lives change, their experience of the museum changes. For example, when I was a graduate student at the University of Chicago, I came to the Art Institute as this great opportunity to learn. How wonderful it was to be in graduate school and hear about theory and learn about abstract ideas and history that’s irretrievable and then to have the real works that people made to respond to social and economic or political conditions right in front of me. Every student, whether he is an art history or elementary student, has such an incredible resource because our collection is so broad; there’s something here from almost every moment in every culture. As I’ve gotten older, I love coming here with my family and friends and I have a whole other experience. It’s wonderful to see the museum and the collection in another way. "I might know a painting that I studied as a graduate student because it was an Expressionist picture. Today, I might appreciate it because it is a painting by Franz Marc and I love Franz Marc’s work. I also enjoy it now because it’s got a blue horse in it and my daughter likes a blue horse. So, it’s fun to see how the life of the museum reflects all of us also as we return to it and our lives continue to unfold." Q: How did you decide to become a curator? D'Alessandro: Well, I don’t know if it’s an interesting story or not, but I was always someone who loved to make art. I thought I would become an artist and for many reasons, I was advised that I should think of something more practical. When I went to college, I knew that I wanted to study Italian and to live abroad for a year. I was really interested in other cultures and thought I might want to be involved in international relations for my career. When I was living in Bologna, we hopped on the train to Venice for the day. We went to this exhibition at this beautiful old building called the Palazzo Grassi. The show was called Futurismo e Futurismi (Futurism and futurisms) by a legendary curator called Germano Celant. I went to science museums as a kid, studied art in books, but I had never really been to a proper art museum in my life. Futurism was this moment right before World War I where a young group of Italians in Rome had decided that they had had enough of the old and decrepit culture keeping them back from the new century. They wanted to get rid of all that old history and start fresh. These ideas moved to Paris and to England and to the United States, from paintings and manifestos to clothing, furniture, house design, music and poetry. I’m in this exhibition kind of blown away. I have an interest in international studies and how the world works. And here I find that art can speak across languages, across media. That these initially theoretical ideas could move a society forward was a revolution to me. I left the exhibition just kind of beyond words. I had the catalog and the poster, everything that I could possibly grab. I said to my friend “…that was really amazing, thank you so much for suggesting we go.” She mentioned the curator “you know, humm humm humm.” And I said, “What’s a curator?” And she told me. I literally got on the train, went back to Bologna, wrote a letter to my school asking if I could change my major because I wanted to work in a museum. And that was it, like a light just clicked on. There was never a question of what I wanted to do once I figured it out. I would not have been as happy being an artist as I am seeing what art can mean. By looking at a painting made in the 30s, we can have an intimate communication with someone from another time about how they felt or about what they were worried about. "To be connected to a past but to also share it with the public is the thing that I love so much about this job. I hope someday to have an exhibition like the one that inspired me. I really do think it is part of my job to inspire people." Department Specialist Robert Burnier and Curator Stephanie D’Alessandro step back to assess the juxtaposition of a DuBuffet and Braque during the Modern Wing reinstallation. Q: A curator’s role is vital, though its true effect might be less apparent to a casual museum-goer. Can you discuss what goes into your process and how decisions about placement and juxtaposition can create a dialogue between works and place artists in a contextual framework? D'Alessandro: I think it depends on the project at hand. I did a Matisse exhibition a few years ago. In that particular exhibition, it was important to select works and put them together in a way that they could show Matisse’s process as it unfolded. Each was a kind of step, even if there were detours, (the process was) not necessarily linear but people could get back to 1913 to watch Matisse develop the idea that comes out in this big picture in the end. For the Modern galleries, we don’t select works outside of the collection. We want to share a story about modern art. It’s a story, it’s not a textbook (because) I don’t have access to everything. So it’s a story about modernism as it is collected and shown in Chicago. The wonderful thing about this space is that for the first time we were able to design galleries that fit the story that we wanted to tell. Up until this point, the modern collection grew and demanded different galleries and different real estate. The Surrealist collection was in a whole other part of the museum, so you couldn’t even see the full legacy of Surrealism in our city until we had these galleries. With this installation, it was important was to find the coherent themes and stories about Chicago and modernism that we could bring together. And then within each gallery, what I’ve tried to do is bring out the dialogues that can exist between works. The great fiber artist, Claire Ziesler was also a great Surrealist collector, and she had this wonderful picture called The Policeman by Jean Miro. It’s a huge canvas. He was inspired by the idea of Surrealism as doodles – automatic drawings. He made a couple squiggles and then as he looked at the squiggles they suggested forms to him. He connected them together and made this figure that looks like a policeman with a circus horse. The picture literally grew from his unconscious. We also have in that gallery a beautiful work by Jean Arp – an abstract marble form of a Torso. If the light hits it the right way it really looks like flesh, almost like you start to see a bone coming up out of a shoulder and it has a sense of movement and growth. They are both beautiful works on their own, but when you put them together they mutually inform each other and suggest that growth in different ways. Whether it’s the Miro form starting to look more animated because you see this torso, suggested shoulder kind of thing or the playfulness of the Arp form even though it is hard marble, you get a sense from the doodly lines of the Miro that the Arp could move. Miro and Arp knew each other. They were part of the same group. Those two works have such a lovely dialogue that they are fun to see together. At the same time, suggestions that you might get from this dialogue help you understand the work. It’s so much better to feel it, to see it, than to have to read a label to understand it. Part of the curator’s role is to have the invisible hand of sort of pushing to what could be told. Another fun dialogue is the one that I think we finally have with our works by Brâncuși. Brâncuși is one of the most important artists of the twentieth century. He was someone who developed abstraction in sculpture, got rid of the base, got rid of the idea of the chiseling or modeling in clay and casting something. He found and chiseled stones and beautiful abstract forms in bronze and put them together in different formations. He would change the orientation, change one piece over to another. At a certain point, he didn’t have a dealer and wouldn’t sell his works. His studio became the entire artwork. He took photos of all his works and it was all about the space between them, the how the light hit them and the dialogue between them. In our old galleries, we had three beautiful stacked Brâncuși works, on three separate platforms, with stanchions around them, solitary in different gallery spaces. We needed the context of Brâncuși’s great revolution, so it was very important for me to have the sculptures together even though they may not have been the three that were together in Brâncuși’s studio. One simple thing was to put them together on a platform, but another was to figure out a way to inspire visitors to see that dialogue between those works. We were lucky that Renzo Piano, the architect for the Modern Wing, was also the architect for the presentation of Brâncuși’s entire atelier at the Pompidou Centre in Paris. When we had our dollhouse for the modern wing, with these teeny, tiny maquettes of all the works, the very first thing we placed in the model were the three Brâncușis together, right in front of windows. We worked with Renzo for just the right size of that platform, for just the right amount of space off the wall, the way that the whole thing would come together with this amazing backdrop of the city of Chicago behind us. There’s no better story for visitors than to turn the corner and see these beautiful buildings that grew up very organically next to each other with the light and the reflections off all those buildings. It’s impossible not to look at the backdrop behind the Brâncușis and not see some of that in the Brâncușis. Q: Diversity is a major focus for the contemporary art world, and for contemporary life. Do these concerns apply to a modern art collection, a period when the most known artists were still predominantly European and American men? Are there artist’s yet to be discovered or explored? D'Alessandro: Some of it has to do with tradition. We’ve lived in a world where men have dominated the European art world. When you think of modern art, the first names you’re probably going to say are Picasso, Matisse, Brâncusi, Kandinsky. It was part of the world at that time, it’s part of what we inherit and what we have to try to break away from. The European modern collection is a great collection with a representation of almost every great artist you want. I’m striving to bring other narratives to the story and alternate stories of modernism at the time. In the past few years, I’ve been adding to our story with detours. For example, we have added works that aren’t traditional oil on canvas. There’s a wonderful work by Wolfgang Paalen, a Viennese artist who worked in Paris. He’s not famous like Dali, but he should be. He developed a process called fumage, which is basically drawing with smoke that collected on the surface of a painting as he held it over a flame. There’s nothing more magical when you think about Surrealism. Simple works like that add to a bigger story. I’ve been trying very hard to add other artists who might have been overlooked in the past. When the galleries reopen there will be a painting that we haven’t seen, a recent acquisition by a Romanian artist named Maxy, He’s one of many European artists who went to Berlin after WWI, the second arts center after Paris. He found a great following with the German art world, but because of what happened in Germany after the 1920s, he is one of the artists we don’t know as well today. So much modern art was eradicated at that time, or forgotten. We may not know Maxy’s name, but he was very important at the time, exhibiting with all the great dealers. This is a wonderful cityscape, pulsating with a kind of kaleidoscopic color. We are also going to have a new acquisition by Joaquín Torres García, who was from Uruguay, the founder of the School of the South. He was right at the side of Mondrian and van Doesburg developing abstract art in Paris in the 1920s and 30s. This is a wonderful wood construction that is very ahead of its time. When you look at it you might think it’s a small Rauschenberg. Q: How do you find new work? D'Alessandro: Well, reading and looking. In the case of Maxy, my dissertation when I was at the University of Chicago was on German art in the 1920s. So I knew his name from art journals from the time. In this particular case, we got a letter with photographs of this painting from a Chicago couple. They said we don’t know who this is, we don’t know what date it is, can you help us in any way? I looked at it and one of the photographs had the signature and I saw that and said, “Oh, it’s Maxy.” I went to visit them and said, “I know what you have!” We developed a friendship. It’s been really wonderful to get to know them and hear their story, a story connected to World War II and a family leaving Germany. Again it’s about an artist whose path was kind of eradicated along the way. Sometimes, it’s just about being open. Looking at a picture and not saying, “I don’t know what that is.” Torres García is an artist whose work I’ve always admired. I have a list of things I’d love to have someday that I share with dealers. It’s about keeping your eyes and ears open, being open and nimble, and persistent. In the case of Torres García I’ve been looking for years, I’ve had lots of opportunity. But, I’m super picky. We’ve got this great collection and you can’t rush. As I got to know Torres García’s career, I really felt like this particular kind of work, this beautiful wood construction was one that would add a lot of complexity to our presentation. A wood construction that is not totally pristine and made from found bits was a good counterpoint to something like a Vantongerloo sculpture which is very white and abstract and pure. Or, a Malevich painting from 1915 that is seamless, almost hermetic in the way that it was painted. I was thinking about a very particular kind of thing, but also being patient. It’s hard. "It’s a great, great honor to be the person to care for this collection right now. It’s a dream job. It’s very easy to walk through the galleries and see what a great opportunity we have here in Chicago. But part of the responsibility that I have is to continue to ask questions about the collection. Where we can improve it? How we can change it up? How we can make it relevant for people today? If we didn’t listen to the first voice that said “Oh, no, no, no…” how we can imagine still greater things for the collection?" 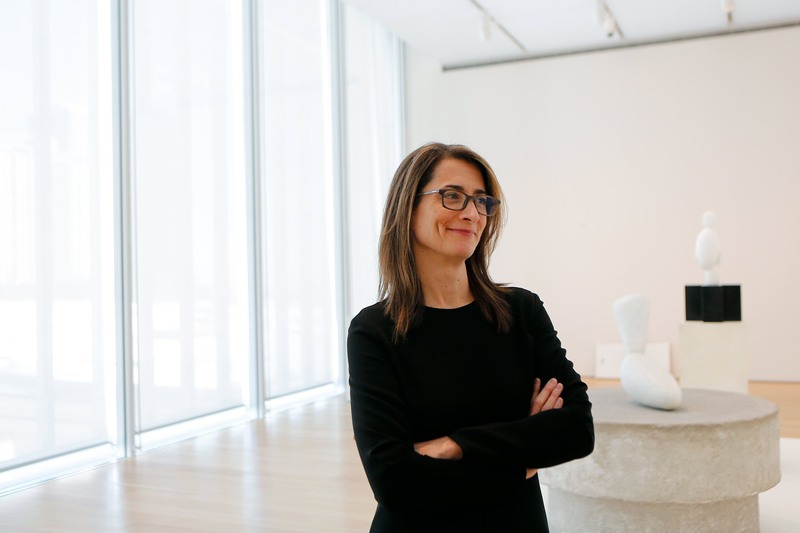 Stephanie D'Alessandro was the Gary C. and Frances Comer Curator of Modern Art, Art Institute Chicago, from 2009-2017. She was interviewed on February 19, 2014.